Motto and Crest “Humble and Loyal”Pomegranate with crown. “The Most Happy”Crowned falcon on tree stump with red and white flowers. “Bound to Obey and Serve”Crowned phoenix rising out of a castle with red and white roses. Date of Birth 16th December 1485 Warnicke thinks 1507, but most historians think 1501 due to a letter that Anne wrote in 1513 when she was a maid of honour in Brussels – this position would be open to a 12/13 year old not a 6 year old. Thought to be 1508 or 1509Elizabeth Norton thinks between Oct 1507 and 1508 because 29 ladies rode in her funeral procession (1 for each year). Who were they? Catalina de Aragón.Daughter of Isabella and Ferdinand of Spain. Date of Marriage and Duration 11th June 1509Nearly 24 years, annulled in May 1533. Either November 1532 or January 1533Just over 3 years. Motto “God Send Me Well to Keep”A gold escarbuncle. “No Other Will than His”Crowned red and white thornless Tudor rose “To Be Useful in All That I Do”Crowned maiden rising from a Tudor Rose. Date of Marriage and Duration 6th January 15406 months 28th July 1540About 19 months 12th July 1543 (Henry was her third husband)Until Henry VIII’s death on 28th January 1547. 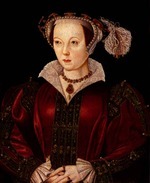 Children None None Daughter Mary Seymour by her 4th husband Sir Thomas Seymour. If Katherine Parr was born in 1512, then in 1548 she was 36. Also Katherine of Aragon’s marriage was never annulled. Henry took it upon himself because of Anne Boleyn! I apologise for the typo, I’ve corrected it. 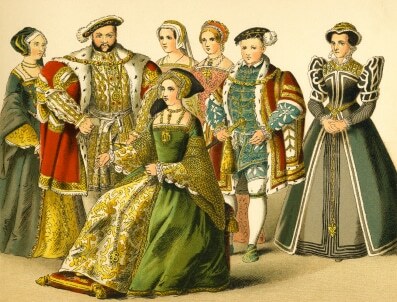 Although the marriage between Henry and Catherine of Aragon was annulled by the Houses of Parliament and convocation (with the help of Cromwell and Cranmer), it was still annulled. Convocation were asked to pronounce their verdict on the validity of a dispensation to marry a brother’s widow, the dispensation which Henry had had from the Pope to marry Catherine and they found in Henry’s favour, declaring that a marriage like Henry and Catherine’s was “impeded by divine law which no pope could dispense and thus retrospectively cleared the way for the union which the king had already entered” (Scarisbrick). Parliament also declared that the marriage was invalid and that the king was free to marry again. I do know what you mean though, as Henry had made it so the English clergy and his Parliament could rule on the issue. Hahaha, I can’t stop laughing at the song! 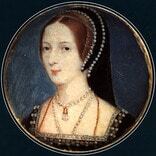 Hi, wasn’t Katherine Howard the daughter of Joyce Culpepper? Catherine’s mother is sometimes referred to as Joyce and sometimes as Jocasta and yes she was a Culpeper. Was she related to Thomas culpeper? Yes, they were distantly related. And Catherine Howard was convicted for adultery with Thomas Culpeper, that is just.. eww!